Please tell me you've been to Chipotle. Please, please tell me you have. If you have not, I'm telling you to go right now. Just leave this blog, drive to your closest restaurant, and order something. Anything. The food there is amazing. It's fast food, but it's healthy and so tasty. I won't even be mad at you for leaving (as long as you eventually come back). It's just that worth it. Chipotle's founder is actually one of the investors in the winner of the new show on NBC, America's Next Great Restaurant. The reason why he was chosen is because Chipotle is a "fast food" restaurant, but it's so successful since it's cheap, quick, delicious and made with natural ingredients. The show is striving to find another new restaurant concept (like Chipotle), but the restaurant must be a unique idea. I hope they do find one because the idea of Chipotle was pure genius, so I'm excited to see what the next big craze will be. As for this rice, it tastes exactly like the one they make at Chipotle. I think I could eat this as as side at every meal and be perfectly content. So if you haven't been there yet, you can make this and kind of sense the perfection I'm talking about. It's really simple and the cilantro, lime and salt add just the right about of flavor. We had it on tacos the other night and it was excellent. Give it a try and let me know how you think it compares! Pour the rice, water, and 1 tbsp of the olive oil into a small sauce pan. Bring to a boil and continue boiling over medium heat until the water just skims the top of the rice. Reduce heat to low, cover the pan, and continue cooking for 15 minutes. Turn the heat off after 15 minutes and keep covered for 5 more minutes. Remove lid and transfer the rice to a large bowl. 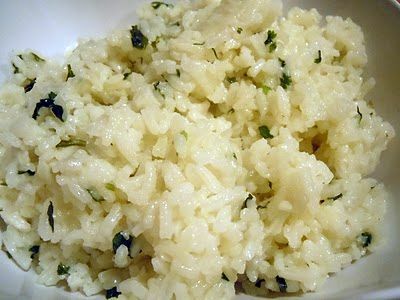 Add the remaining tablespoon of olive oil, the juice of the lime, and the finely chopped cilantro to the rice. Mix well and slowly add salt, to taste. Adjust seasonings as needed, adding more salt and lime juice if necessary. I love Chipotle and I love their rice! I have made a similar knock off and it really hits the spot! It really does! I wasn't expecting it to taste so similar to the real thing, but it was pretty on point! Okay...I am taking your word for it!! I love Chipotle's rice so this will be great. Any ideas on how they make their Guacamole?